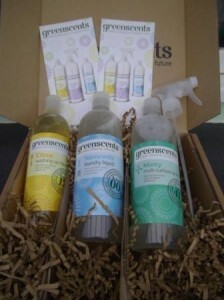 For the past couple of weeks I have been testing greenscents cleaning products that they very kindly sent me to review. The products include Citrus Washing Up Liquid, Minty Multi surface cleaner and the Nonscents Laundry Liquid. I love the Citrus Washing Up Liquid, firstly is smells lovely, however if you don’t like citrus it also comes in an unfragranced version too. I live in quite a hard water area so sometimes natural washing up liquids don’t foam very well or they do initially but then don’t last. This was not the case with this washing up liquid it foamed well and the bubbles stayed till I had finished washing up. It was also fantastic at cutting through grease. It is good value for money compared to other similiar eco-friendly products at £2.50 for 500ml. Minty Multi Surface Spray again this smelt gorgeous, the minty smell was fresh. If you don’t like a Minty smell in a surface cleaner they also come in Lavender, Citrus, Herbal and unfragranced. The sprayer worked well and it cleaned brilliantly. It is anti-bacterial so perfect for cleaning the bathroom or kitchen. It is good value at £3.95 for 750ml. All the greenscents product are made in Dulverton, Somerset using Exmoor water. The products also use organic and ethically sourced ingredients. They are certified organic by the Soil Association. I would give these products 4.5/5 Green stars and the Green and Natural Living seal of approval. I would recommend these products to anyone who is looking for a green product to use instead of their usual chemical cleaner. If you would like a chance to win a set of greenscent cleaning products including the products I have reviewed above. Please add a comment below, like my facebook page Green Aspirations and like greenscents facebook page. I will then choose a person at random on Tuesday 28th August at 5.00pm to win the greenscents cleaning set. If you have not liked both facebook pages and commented below you will not be eligible to win. For this post I received the products to try at home. I was also sent other sets, one of which I am using as a prize here. I will also run another competition on Twitter. Never really like lemon w/up liquid as it smells artificial, but always willing to try!